The book has a ringside view of the politics of our country with a refreshingly candid honesty. Newspapers must be read with the caution of a minesweeper. Their pages are designed to manipulate and hypnotize us to buy or believe – to facilitate the transaction of money and power. We are not in the newspaper business, we are in the advertising business. A quote, which saves me the effort of having to belabor the point. When I read them, I look at their façade and always wonder what the real story is. And yesterday I got to read one. It was subtitled ‘a roller coaster ride’. I started the book after a light lunch and had hurtled through it by bedtime – by when my head was spinning. It is written by a woman who has had a ringside view of the politics of our country. The camaraderie and intrigue, the comic and the tragic, the historic and the venal. It is all there, shorn of political correctness and hypocrisy – but instead narrated with a refreshing candor. Swamy combines a sharp mind with an unconventionally blunt approach. Two qualities that, when they converge, grasp onto the essence of things and cut through the fluff in the way they are shared. Provocative, disruptive and completely unpredictable. But if you observe the man’s selfless history and trust his insightful intent – there is tucked within his words and deeds an overarching clarity about the way forward. You may not agree with everything about his approach, but this much most people will agree with – that to debate on any issue one must first understand both sides of the argument. And what Swamy provides is a powerful, deeply thought through perspective that deserves to be understood so that it can form the basis of discussion. Instead of being dismissed in a cowardly fashion, as done by a multitude of journalists, so that the onus of debating him never arises. Fashionable ideologies are a poor adversary to insights gained from a deeper understanding of reality. It is indeed his ability to connect directly with and inspire millions of people that marks his ascendancy in the internet age. There are many who wield similar influence. But it is the holistic perspective with which he sees the world and the tenacity with which he pursues his mission that elevates him into an object of awe, fear or ridicule – depending on where you stand ranged against his views. It also reminds us of what a powerful tool the internet can be for the cause of truth and democracy across the world. What Swamy is not – is an armchair critic. He battles the powerful in the dark underbelly of our society – and cuts holes through the quagmire of corruption with the sword of our constitution. A sword that looked like a blunt instrument until he demonstrated otherwise. And this is his story. It is penned by a woman whose love and admiration for him is obvious. She also sees him for what he is. A man of precocious intelligence, with disarming charm, contrarian perspectives, unrelenting gumption, dangerously adversarial, devoid of sentimentality, prone to controversy and with the fighting spirit of a bull. Given the long years they have spent together, it is evident that they are qualities that she shares in some measure. This is a book that pulls no punches and has no pretense. Swamy is often branded as an eccentric opportunist – who drifted in and out of political affiliations to remain relevant. The book reveals the people in power and the circumstances that forced him into that situation and the long road back. And yet, how the nature of the beast remains the same, as quarters within the ruling powers continue to thwart his ascendancy to office. It is his pragmatic assessment of the reality of human nature and our times, that perhaps fashioned his approach to move beyond them and yet serve the nation in an outsized manner. It sheds light on the monopolistic power of the erstwhile media to mute voices like his that were inconvenient – and the rise of the internet age that lends truth to power and provides men like Swamy the ability to control their own narrative. There are gems tucked in that reveal the absurd hypocrisy of the world we live in. Like a brief indictment of P-notes – the blatant, yet perhaps practical tool devised to allow black money to return to India in a legitimate avatar without any penal consequences – before the screws were applied on the scraps of black money that remain stranded abroad. The perfect ploy to keep the classes empowered even as the masses bay for their blood on TV Channels. It epitomizes the nature of our public discourse – which is an imaginary drama that unfolds at a safe distance from reality. Given Swamy’s predilection to say things as they are – the fact that he is a thorn in the flesh of anyone with a vested interest is evident. The long journey between a dystopian reality and a utopian ideal is pebbled with the stones of compromise and pragmatism. It is within the folds of this judgement – often required for the larger good – that the opportunity to distort for personal power and profit arise. This occurs within an unwritten compact of reciprocity – that can only be maintained by looking the other way. And the participants in this vulnerable but enduring arrangement are the ones who fear Swamy the most. The long list of his court battles, both completed and ongoing, stand testimony to this. And yet the story of Swamy’s disapproval of her father’s punctilious handling of their ornamental ‘pattawala’, for the absence of ‘viveka’ or discrimination, captures a powerful context to the pursuit of justice. It underscores the need for the good fight to be one that serves a larger collective purpose and not one that emphasizes personal moral judgment. Swamy is the descendant of the Army Commander in Chief of the seventeenth century Madurai Monarch. From there flows a genetic predisposition for battle. He is akin to a one man army, who chooses his battles. He targets the most powerful and what he considers the most important imperatives of our times. The book takes us through the barrage of counter cases that were unleashed to bury him – a fascinating story in itself. His ability to navigate through them reveals an incredible courage that borders on the quixotic, a deep understanding of the judiciary and a dynamic presence of mind. All beautifully captured in his first turn as his own counsel against Mayor Pai’s defamation suit, that he defanged before Ram Jethmalani’s band of lawyers. Decades later, as the arguments in the Supreme Court in a corruption case launched by Swamy came to a close, the Judges sought a promise from Swamy to never give up his fight against corruption. It underlines the enormous role he played in giving that August Institution the opportunity to demonstrate its power to protect our democracy. We live in a world and a nation fraught with far more divisions than we care to acknowledge – hidden faultlines across which we are forced to battle on a daily basis. Beginning with religion, gender and socio-economic class hierarchies and percolating into the basic human values of dignity, respect, relationships and freedom. To build on towards a world where love, peace, partnership and equity are intrinsically fostered, the external tools of the constitution alone are not sufficient. What they require is the flowering of a deeper collective understanding from within. The debunking of Max Mueller’s Aryan migration theory reinstated the enduring antiquity of our collective existence and has begun to gradually resurrect confidence in our own civilizational heritage as a source of ancient wisdom that remains relevant. The Sanathana Dharma – an evolved perspective towards the purpose and meaning of life – that predated the concept of religion, is the fountainhead from which stems the Hindutva cause as espoused by men like Swamy. It is a coherent and rational view of reality and a way of life that leads towards enlightenment. It does not run in conflict with any religion. As Ramakrishna Paramahamsa said, after practicing Christianity & Islam, all religions at their core guide us to the same destination. But it is deeply misunderstood and misrepresented, by people from both without and within, evident from the bigotry with which it is fought for and the superficiality with which it is critiqued. Having said that, in the precariousness that pervades life across rural belts, urban slums and middle class hopes – religion is also deeply intertwined with the politics of community, livelihood and survival. It is a Gordian knot that can be cut only when the individual is empowered, or the state intervenes to provide them, with a sustainable means towards economic independence. Being an idealist on an empty stomach, that stokes a far more visceral sense of urgency, is a luxury that does not exist. And it is in this environment that a need for a far more cohesive and constructive Hindu identity is envisaged, one that stems from the sentiment of ‘Vasudhaiva Kutumbakam’ – the world is one family. It is a delicate cause that needs actions that stem from wisdom and foresight and not from sloganeering and self-righteous posturing. Swamy’s earnest involvement in spreading a greater understanding of this cause is briefly alluded to but not spoken of in depth. Perhaps this remains the reserve of Swamy to expound on. 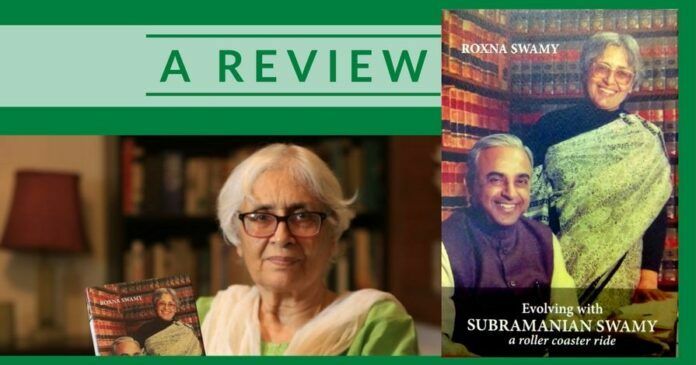 What Swamy embodies through the book, is an openness to embrace all that life throws at him and a deep and eclectic curiosity that straddles Mathematics, Economics, Mandarin, Law, Religion and History. Anything that draws his attention seems to get mined by him until he is able to hold his own with experts in the field. It is this prodigiousness that enables him to deeply engage in multiple diametrically varied pursuits at the same time. The book does not dwell into the thought processes and motivations that drive Swamy. It instead, tells a story of the dynamic nature of his life and the world that swirls around him. And through this dynamism, we get a glimpse of the real world – the one that is hidden behind the newspaper stories and drowned out in raucous TV debates. Roxna herself comes across as someone with her Parsi sensibilities intact. From her stubborn enforcement of queues, her sustained disappointment towards those who she believes wronged Swamy, her hard-nosed efforts to obtain party accounts from a powerful member sitting beside his cow in a first floor government bungalow room to her appreciation of art, monuments and the birds chirping in her bungalow compound that Swamy dismissed as morning cackle. The maverickness of the man is epitomized by his blasé response, “I have a billion Indians to work for”, to the decision by Harvard to drop his courses in response to the controversy stoked by one of his editorials. It demonstrates his confidence in his convictions, his comfort in his own skin, the higher purpose that inspires him and his irreverence towards the inevitable spinelessness of institutions. Qualities that probably give Swamy the kind of commitment and resolve that he demonstrates. The story ends in 1991. The sequel unfolds before us – but deserves to be retold by her. Anand is a third generation entrepreneur at Vijay Tanks & Vessels (P) Ltd., an Industrial Engineering & Construction Company that builds Oil & Gas Storage Tanks & Process Equipment. He is a devotee of Ramana Maharishi & Nisargadatta Maharaj. His personal blog is anandaonly.wordpress.com. As ever before you have handled this Book Review – “The Roxana Rollercoaster “with intense maturity and very admirably. A rare review which effortlessly provides a peep into the subject of the book, the theme of the book and the author, and written with a depth of understanding, and an eye on the larger picture. The conformists may maintain the order and flow of society, but its the mavericks who are the agents of change in a society miring itself in hubris. Anand’s review points to such a biography and urges one to get the book. great piece of writing, indeed.